We have recently seen ways that temporary tattoos can be used to replace pin-prick blood tests, turn the body into a touchscreen, or act as functional interfaces. 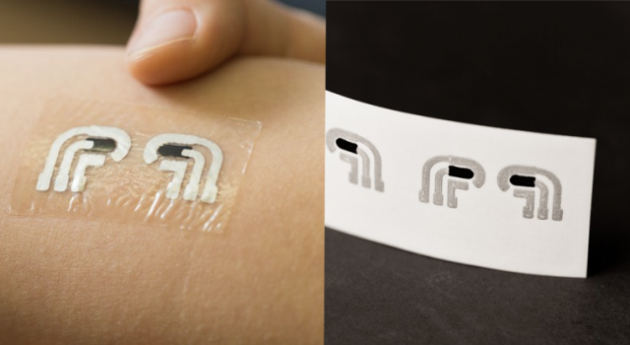 Now, researchers have designed a temporary tattoo that can be used as a wearable electronic device. The graphene health sensor, developed by a team led by Deji Akinwande and Nanshu Lu at the University of Texas at Austin, is similar to commercial health and fitness trackers. But because they are ultra-thin and can conform to the skin, they can provide a much higher quality of data. The researchers hope the tattoos might offer a replacement for existing medical sensors, which are taped to the skin and require a gel or paste to conduct. The tattoos are made of graphene coated with an ultra-thin layer of a transparent polymer. This is then placed on a piece of ordinary tattoo paper, and carved into different patterns to create different types of sensor. The finished tattoo is then transferred to the skin by applying water to the back of the tattoo paper to release it. The tattoos will last for around two days and can be peeled off using a piece of adhesive tape.